One thing which I find interesting about this armour is that it is probably closer to most of the armour worn by Japanese soldiers than most of the armour in museums outside of Japan. 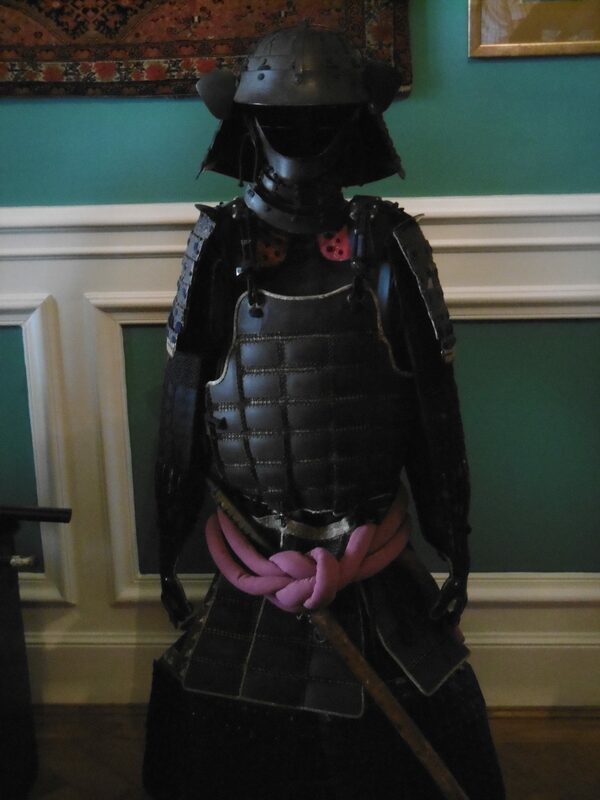 This is a tatami or folding armour, made from small plates sewn to a cloth backing. The plates do not overlap, but are usually joined by mail, as on this armour. It has a relatively fashionable cut, with the drawn-in waist which characterized Japanese armour from the 16th century onwards. The lacquer is plain black, and the lacing dark blue- a colour which was preferred because it was durable and not too conspicuous (some plant dyes were prone to fading or rotted the silk). The skirt of tassets (kusazuri) are hung on frogs instead of the traditional row of silk laces. This reduced the need for costly materials, and reduced one weak point in Japanese armour: there was usually a gap several inches wide between cuirass and tassets which could admit thrusts and bullets. More expensive armours had more tassets, which created a more graceful look and did not force the wearer to shove around so much weight as he moved. Folding armour was not the strongest: bullets might hit the mail instead of the plate, and spears and arrows might glance off the plates and slide into the interconnecting mail. But it was easy to store, and more flexible than most Japanese armour, which was riveted, laced, or lacquered into a solid mass even if it was made of small plates. It was easier to hide under outer clothing than more respectable armour. That was important in an age with few large battles but many assaults, duels, and skirmishes between factions. (Since 1995, tatami armour without the connecting mail has been beloved by costumers in European historical and fantasy dramas like Braveheart and Game of Thrones, because it is cheap to make in the 21st century and looks like armour to people who have never seen the real thing). 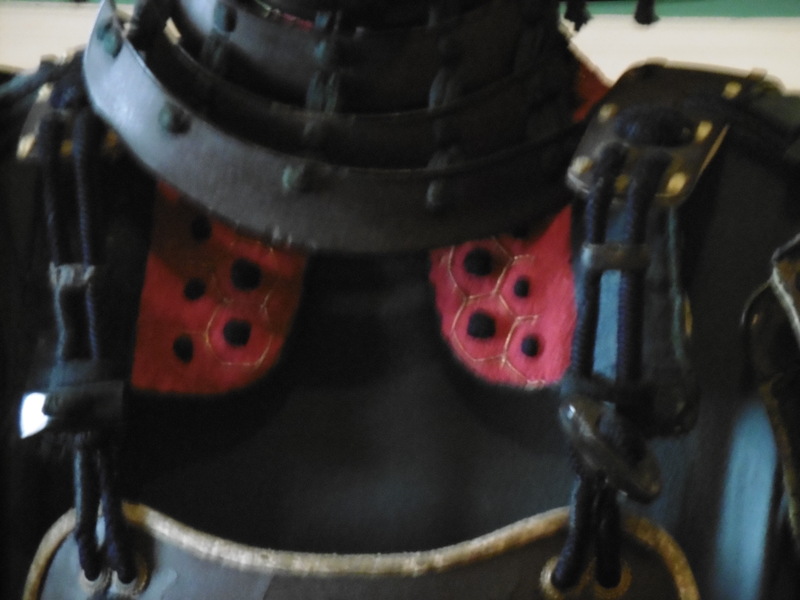 Detail of the neck area showing the folding collar of kikkô (small hexagonal plates laced between layers of cloth) and the yodare-kake or “bib”which protects the throat. This armour has extensions of kikkô attached to the shoulder-straps. While they are displayed flat, they are designed to fold upwards following the wearer’s body and protect against sideways cuts to the neck. 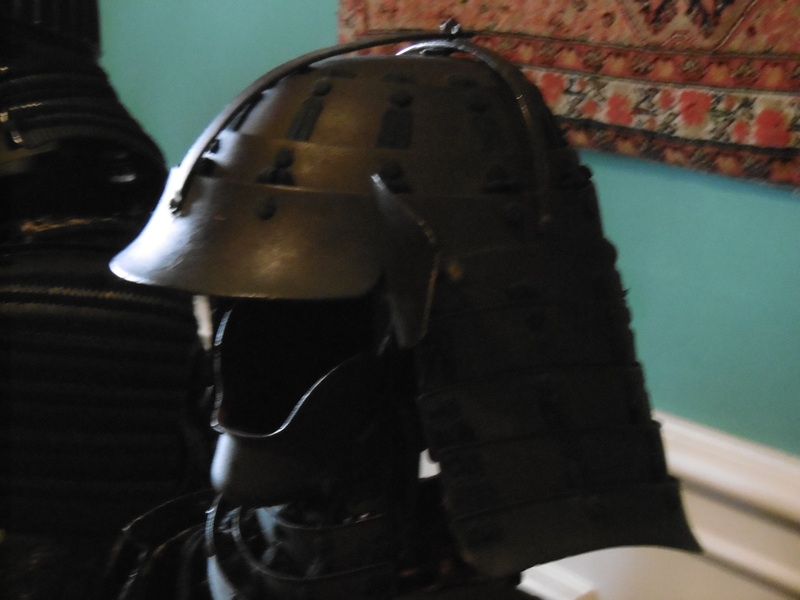 The neck area tends to be a weakness of Japanese armour, especially the area above the cuirass. The bib of lames which hangs down from the mask partially covers this area. It is made of solid lames (rather than small plates) and laced in the “sparse” style rather than a continuous row of laces. Brightly dyed silk lacing was expensive, the time to lace the armour cost money, and Sakakibara Kôzan pointed out that when silk laces were soaked in water they became very heavy- an important point in Japan, where service in ‘the field’ involved wading through rice paddies or crossing irrigation canals. The tatami kabuto (folding helmet) of the armour in Silesia. The helmet is also of folding construction, in this case a frame of iron bands over a collapsible set of lames. This was not as strong as a construction of fewer plates riveted together, but was easy to store. It has a partial mask or hanbô, cheap to make and practical to wear, and a simple shikoro or skirt with small blow-backs which prevented sword-cuts from slipping into the gap between the bowl of the helmet and the shikoro. This is a simple, practical armour- neither the cheapest nor particularly fancy. In that respect, it is closer to the vast majority of armour worn by Japanese soldiers than the elaborate repousséed, brightly-laced suits which appear in art museums today. Many of these were made to please foreign tourists or wealthy patrons who never expected to wear them in anger. Further Reading: Some good free resources on Japanese armour are Ogawa Mohiro ed., Japanese Arms and Armour, 1156-1868 available for free as a PDF from the website of the Metropolitan Museum of Art and Anthony J. Bryant’s Nihon Katchû Seisakuben: An Online Japanese Armour Manual. I would be tempted to spend a weekend making a sample then poke at it with a knife or spear! Anthony Bryant gives instructions, and a backyard experiment is better than nothing. Indeed; and if memory serves, it is butted mail – which is simple to make.